is a book written by 20 leading authorities who share their insights and strategies for discovering opportunity, prosperity and peace, in a world of constant change. We are living in "interesting times" and these interesting times have brought about a major shift in the values and priorities of today's work force. The unrest in the world and the uncertainty of job security have caused many employees to re-assess their dedication to their jobs. 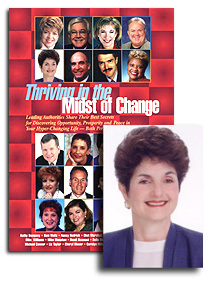 In the chapter on The Power of a Vision ... A Leader's Journey, Barbara Mintzer discusses two leadership styles that motivate today’s ambivalent employees to buy into the corporate vision. These two styles, used during different stages of organizational change, are the visionary and the coach. The visionary has the challenge of formulating and articulating a corporate vision that employees can buy into and work towards. Barbara explains why it is so important for leaders and employees alike to have a vision, and presents the very specific, very powerful strategy of the 15-minute vision meeting to get buy-in from your employees and make them accountable for the corporate vision. Once your employees are actively supporting the corporate vision and working towards making it a reality, coaching is the most effective way you can sustain employee productivity and effectiveness. This hands-on, one-of-the team style of management provides a climate that is conducive to keeping employees motivated and engaged in their work. In this chapter, Barbara discusses the 4 key qualities to effective coaching. "Most recently I had the opportunity to read your chapter of 'Thriving in the Midst of Change.' It was outstanding!" This book is being offered at the special Conference price of $15.00 plus shipping. An autographed copy may be ordered directly from Barbara Mintzer by phone (805) 964-7546, or by e-mail: bmintzer@barbaramintzer.com. Volume discounts are available.